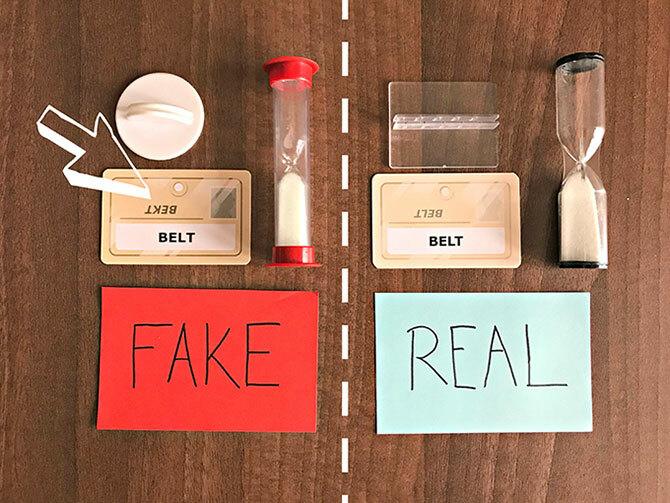 Over the last few months, there have been increasing numbers of reports of fake or counterfeit games. The quality of these forgeries is extremely variable and a huge range of games appear to be affected, from popular gateway games like Ticket to Ride: Europe, 7 Wonders or Dominion to more complex games like Terraforming Mars. 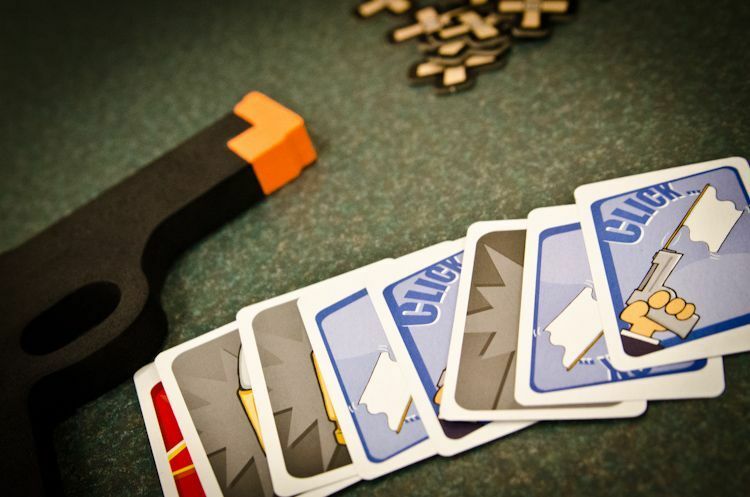 Card games like Codenames might be thought of as an obvious target due to how simple they are to reproduce, however, one of the most affected games is Azul, and reports suggest that it is the cardboard components that are poor quality—the plastic tiles are indistinguishable from the genuine articles. Poor print quality on the box, in some cases a linen finish will be in the photograph rather than real texture. Sometimes the text is also in poor English as for Qwirkle, and the images may be misaligned, blurred and/or pixilated. Card quality may be poor, and there are often typos due to the use of Optical Character Recognition (OCR) which sometimes fails due to the use of graphics behind the text—one of the key indicators of a counterfeit copy of Terraforming Mars is that the letter “R” is missing from the name of some of the cards. Sometimes the images are also misaligned and the cards often don’t wear well. In the case of Dixit, the cards are also a lot smaller. Any punched components might have the die-cut and graphics misaligned, as well as being of thinner card-stock than the original. In the case of Carcassonne, the features on the tile-edges may fail to match up and there may be “nibs” where the tiles are removed from the frames. Plastic pieces may exhibit small burrs or faults where they have been taken from a mould and not finished properly. In some cases like Pandemic Legacy, the genuine contagion cubes are slightly rounded, where the fakes have sharper corners. Component quality may be apparent in the weight as well as the size and surface features, for example, the poker/gem chips in Splendor are lighter and also have mould marks on the edges. Sometimes there are pieces missing altogether, some copies of Ticket to Ride: Europe come with only one station in each colour instead of three. Often the artwork is not as vibrant as in the original (though this can be hard to spot without a genuine article for comparison). Some counterfeits are very high quality however. This can be due to the so-called “third shift work“, where a game is made in a factory that is nominally closed overnight, but the workers gain access and create bootleg copies with stolen material or off-cuts. Some of these are very good, but in some cases they also use parts that failed the quality control tests. In such cases, the seller maybe more of an indication. If buying on ebay or Amazon market place, beware if the seller has a strange name, claims to be located in the UK but isn’t, and has a very long delivery time. In such cases, the scam is often to get payment a long time in advance, so that by the time the item is delivered (if at all), they are long gone. Finally, if it sounds too good to be true, it probably is—caveat emptor: Buyer Beware! 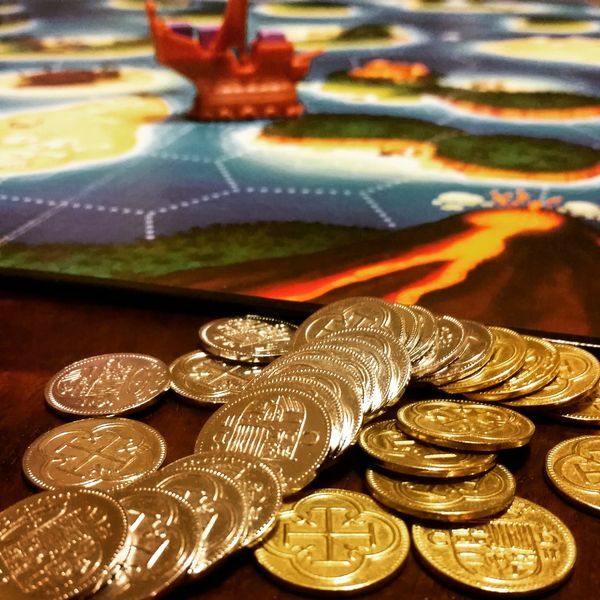 This entry was posted in News and tagged Azul, Carcassonne, Codenames, Dixit, Dominion, Pandemic Legacy: Season 1, Qwirkle, Splendor, Terraforming Mars, Ticket to Ride: Europe on March 11, 2019 by nannyGOAT. Green and Burgundy were the first to arrive, and were stood on the doorstep at 7pm on the dot. This was possibly just because they were punctual, but may have been because they knew the first people to arrive would get the chance to set up the track for the evening’s “Feature Game”, the gorgeous, dexterity car-racing game, PitchCar. Everyone had played it before except Azure, so he had a quick run of the track while Blue put out snacks and Pink sorted everyone out with drinks. Like last year, Green and Burgundy designed a single, long, winding path with the idea being that it was a simple sprint to the finish rather than several circuits. Building the track is always a challenge, but Green and Burgundy had decided to maximise the difficulty by trying to use every piece of expansion in the box, including both crosses and the new double jump. This made the track really quite complex, featuring a wide bridge/tunnel and a couple of jumps (for those brave enough to give them a go). Rather than the usual “flying lap” to see who starts, each player had a single flick with the longest going first. Blue took pole, but didn’t make it as far on her second attempt and within a few turns was in the lower half of the placings. Similarly, Purple who had started second on the grid quickly began to move backwards too. In contrast, Pink and Green who had started at the back of the grid, began a rapid rise through the field. There were some really spectacular flicks, some that were successful, others that were almost successful, and a few that were horrific failures and received suitable opprobrium. The final bridge proved to be one of the greatest sticking points though as it was built from pieces that weren’t really intended to be used in that way, making joins quite difficult to traverse. Blue, who had gone from the front to the back and back to the front, was the first to get stuck, but was forced to watch as Pine cruised past her showing her how to do it. She proved a slow learner, however, as Green and Pink followed a couple of rounds later, while she struggled to make it over the step. With the bridge so close to the finishing line, it turned out to be the discriminating factor in the race, and Pine finished the clear winner, with Green finishing a short nose ahead of Pink. Meanwhile, the rest of the field passed Blue who by now had finally made it onto the bridge, but who seemed to have run out of fuel and limped home in last place, a couple of flicks behind Burgundy, who had been convinced no-one would be challenging him for the wooden spoon. While everyone else participated in the game of cooperative Tetris that is packing the track back into its case, Blue put the finishing touches to the supper of Cheesy Pasta Bake with fresh vegetables and a side order of Christmas trimmings. These included “Pigs in Blankets” (or rather “Boars in Duvets”), “Devils on Horseback” and home made crackers that went off spectacularly and sent a shower of tiny pieces all over the room. With food finished, there was a quick game of “Musical Chairs” before everyone settled into two groups for the next round of games. The first group, Green, Pine, Purple and Burgundy, fancied a bit of piratin’ and went for Black Fleet, a fairly simple, but thematic game. The idea is that each player has a fleet consisting of a Merchant ship and a Pirate ship; there are also two Naval ships which players also control. So, on their turn, players choose one action card which enables them to move their two ships round the archipelago depicted on the large and sumptuous board. Before, during or after moving, ships can carry out an action. Merchant ships can can load or sell goods at an appropriate port, while Pirate ships may attack an opposing Merchant vessel in a neighbouring space and steal one cube of cargo (earning two Doubloons for its trouble) or bury some cargo they’ve stolen. Ships can only carryout one action on their turn, so Pirates can only steal or bury on their turn, not both. And they must avoid the Navy frigates as they do it because they can sink Pirate ships (also earning two Doubloons). In addition to the Action cards, players can also play as many fortune cards as they like; these break the other rules of the game and and make play a little more unpredictable. Finally, there are the Development cards, which both give players extra powers and act as the game timer, with the game finishing when one player has paid to activate all their Development cards. There was much piratin’, tradin’ and policin’ of the ocean waves. Purple was an unfortunate early target simply for being in the wrong place at the wrong time. Green tried to target Burgundy, but a wily Merchant, he maintained his distance. Initially a lot of action took place on the western side of the board, and while Green began to bring in the money, Pine and Purple struggled to gain traction. Green was the first to activate a Development card, but he was followed by Burgundy on the next turn. By now Purple and Pine were complaining loudly that they were being picked upon, but that’s the trouble with this game, it tends to reward the leaders. Green and Burgundy activated their second cards in the same turn, but Green’s was of a higher value, meaning that he then activated his third card (the one with the lowest value) the following turn. By now the action had shifted to the east, Purple and Pine had finally managed to earn enough to activate a card, but by this time they were so far behind their chances of winning were almost zero and so their tactics changed to “get Green and Burgundy”. Unfortunately for Burgundy his ships were closer to Purple and Pine than Green’s were so he bore the brunt of their attack. His merchant ship was attacked and raided by both their pirates in the same turn and his path was blocked. Burgundy abandoned his plans to move it and opted to becalm his ship instead taking compensation for his lack of movement. Green and Burgundy activated their fourth cards in the same turn, but Green had eight Doubloons left while Burgundy only had two. The next turn played out as expected with Green landing a load, activating his final card with four Doubloons left. Burgundy could gain nothing on his final turn, so couldn’t activate his final Development card. Unfortunately, the reward mechanism of gives bonuses to those who activate their Development cards first, which often leads to a runaway winner that the others are unable to catch. That said, it is a fun game and doesn’t last overlong, so is a good game when players are in the mood. Meanwhile on the nearby table Black, Pink, Blue and Azure we trying out a new game, Sagrada. This is a relatively new game, that we’ve only played once in the group before, as part of a “Monster Games” session some months ago. A bit like Terraforming Mars, it is a game that has proved very popular, but was produced by a very small company who did not have the infrastructure or commercial clout to satisfy the demand which vastly exceeded expectation. 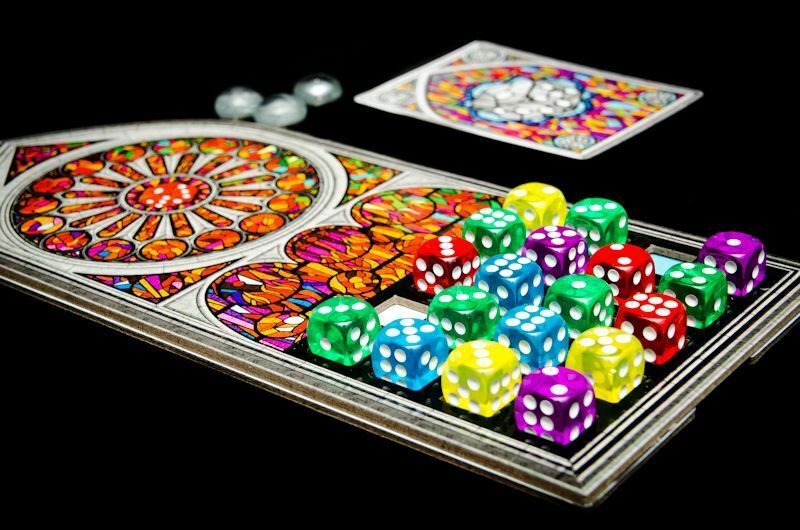 In the case of Sagrada, however, the game is one of those games with simple rules, but lots of complexity. Players build a stained glass window by building up a grid of dice on their player board. 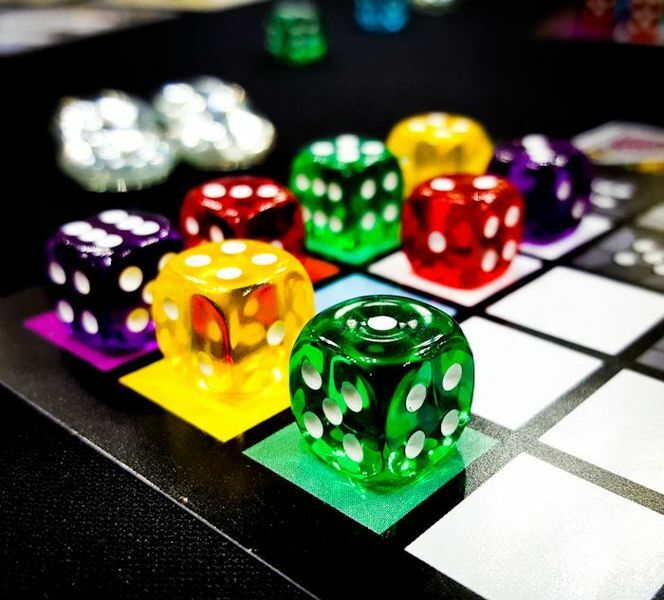 Each board has some restrictions on which colour or shade (value) of die can be placed there and players take it in turns to take dice from a pool and add them to their window. 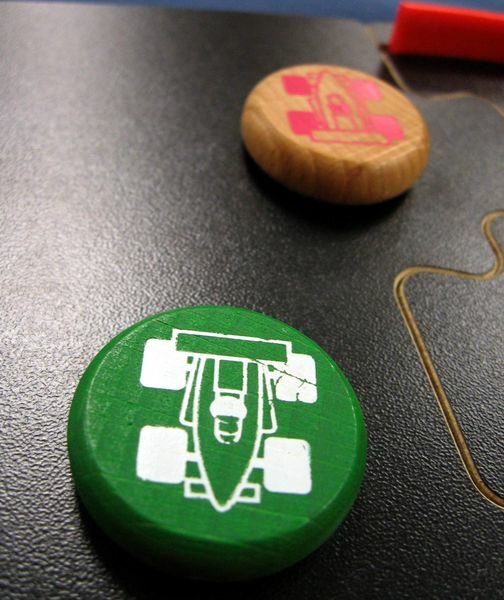 Depending on the difficulty of the starting grid, players start with a small number of favour tokens which act as “get out of jail free” options and allow them to use special tools to rearrange some of the dice, either during “drafting”, or sometimes those already in their window. Points are awarded for fulfilling certain criteria, depicted on cards drawn at random at the start of the game. Although completing the window can be challenging in its own right if the dice don’t roll well, it is the objective cards that are the key to the game. Each player has their own private objective which scores for the number of pips displayed on dice of a given colour in that player’s window. The public objectives are much more complex though. In this case, the three objectives were: six points for every row with all five colours; two points for every pair of dice showing one and two; four points for every set of five different colours in the final window. Black quickly spotted the synergy between two of the objectives, noting that each row that contained all five different colours would score a massive ten points. Meanwhile, Blue had drawn starting grid cards that were very challenging and was forced to make the best of it, and Pink and Azure, struggled to get to grips what they could and couldn’t do. Each round, players draw two dice from the pool in “Settlers starting order” (i.e. 1, 2, 3, 4, 4, 3, 2, 1). This was something we really struggled with for no very good reason, and things weren’t helped by Blue who got herself into a mess, aggravated by the fact that she kept knocking the dice in her window with her sleeve. Through it all, Black sailed serenely, finishing with a perfect set of five rows, each with five different coloured dice giving him a massive starting score of fifty which he went on to top up to a final total of sixty three. Nobody was going to catch him, but Azure finished in second place with a highly creditable fifty-six, some way clear of Blue and Pink. Both games finished almost simultaneously, and just in time to toast the New Year in and admire the spectacular fireworks in the general direction of our erstwhile gaming home, The Jockey pub. With the festivities over, it was time to choose our first game of 2018, and we picked Ca$h ‘n Guns. 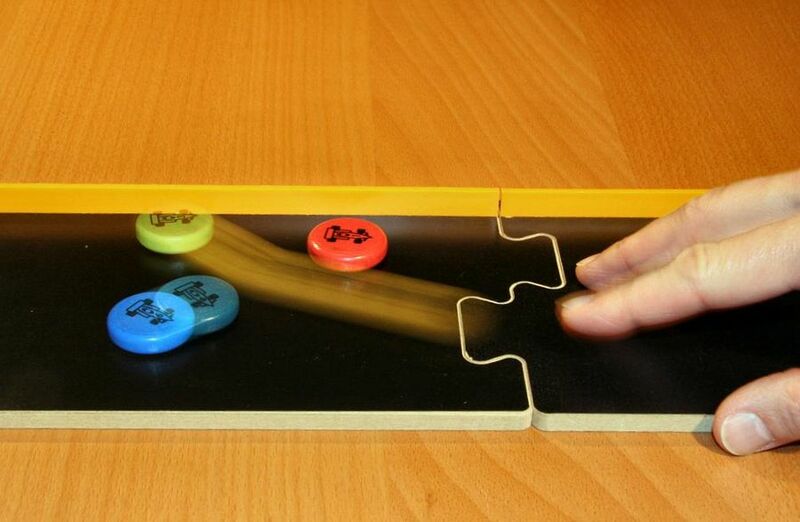 This is a great party game, that we’ve played at the last couple of New Year parties. This game combines gambling with a little chance and a dash of strategy, based round the theme of gangsters divvying up their ill-gotten gains by playing a sort of multi-player Russian Roulette. 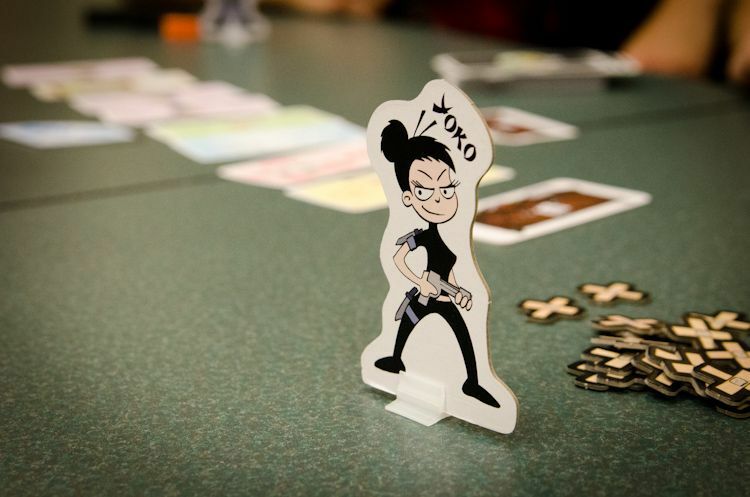 Although we used some of the standees from the Expansion, this time we didn’t use the special powers and stuck to the game play of the base game. This is very simple: on the count of three, each player points their foam gun at one other player; the Godfather can then ask one player to change their choice before there is a second count of three giving players a chance to withdraw from the confrontation. At this point, everyone still in the round who has a target who has not backed out, reveals whether they chose to load their gun with a blank or a bullet. 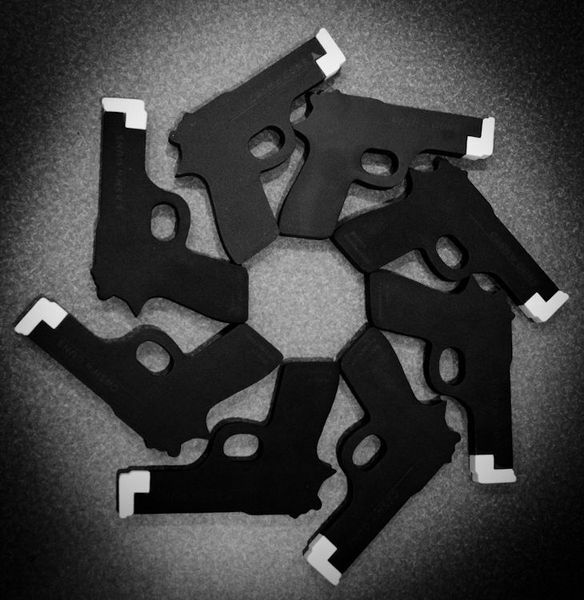 The game is played over eight rounds and each player starts with three bullets and five blanks, all of which cannot be reused. Anyone who gets shot is out of the round and anyone who receives three wounds is eliminated from the game. We were all quite cagey at the start, so the loot was shared out among the whole group. This didn’t last of course, and it was amid much hilarity that Azure decided to brave the three guns pointed at him only to take three bullets and retire from the game. It was a few more rounds before the next casualty expired, when Black took his third shot and gracefully slid down the curtain to join the choir invisible. Meanwhile, Green and Blue were somewhat hampered by being repeatedly targeted, leaving Pink to collect a large pile of artwork and Purple a huge pile of diamonds. The only real question which of the two was worth the most. Despite picking up the bonus for the most jewels, giving her a total of $122,000, Purple had to settle for second place behind Pink who finished with a fortune of $175,000. Pink, highly satisfied with his success decided to do some washing up, and Green who had to prepare a roast for the next day decided it was time for him to go to leave. Nobody else wanted to go though, so it was only a question of what we would play. It was gone 1am, and nobody was in the mood for anything deep, so we decided it was a good time to introduce Azure to 6 Nimmt!, one of our favourite light, filller games. A very simple “Cards with Numbers” game, 6 Nimmt! gives players the illusion of control while everything is going well, and shatters that illusion when it all goes wrong. We usually play the game over two rounds and it is remarkable how differently they can go. In this case, Azure and Blue came off worst in the first round, however, Purple and Black did particularly badly in the second round, so Azure finished joint second with Burgundy, just two points behind the winner, Pine. By this time, the rain was pouring down, but it was definitely “late”; it had been a great way to say goodbye to 2017 and welcome in 2018. Learning Outcome: It is a great way to start the year, with a foam gun in hand and a group of friends to point it at. This entry was posted in Games Night and tagged 6 Nimmt!, Black Fleet, Ca$h 'n Guns, Ca$h 'n Guns: More Cash 'n More Guns, PitchCar, PitchCar Extension, PitchCar Extension 2: More Speed More Fun, PitchCar Extension 4: Stunt Race, PitchCar Extension 5: The Cross, PitchCar Extension 6: No Limit, Russian Roulette, Sagrada, Terraforming Mars, Tetris, The Settlers of Catan on January 8, 2018 by nannyGOAT. In 1990 the German magazine “Die Pöppel-Revue” introduced The Deutscher Spiele Preis, or German Game Prize, which is now awarded annually at the International Spieltage, Essen. While the Spiel des Jahres rewards family games and is awarded by a panel of judges, the Deutscher Spiele Preis is awarded based on votes from the industry’s stores, magazines, professionals and game clubs. For this reason the Deutscher Spiele Preis tends to reflect “gamers games” and is usually more in line with the Kennerspiel des Jahres. This year the award went to Terraforming Mars with the winner of the International Gamers Award, Great Western Trail, as runner up. 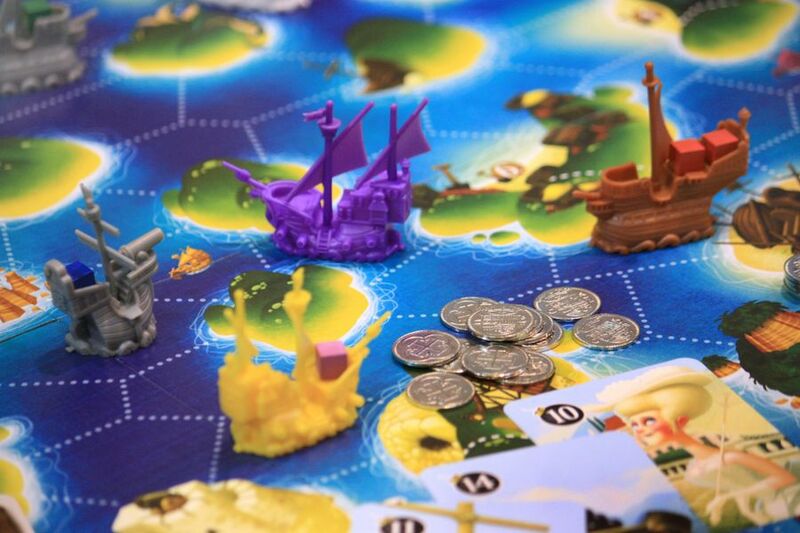 The 2017 Spiel des Jahres winner Kingdomino was joint sixth with the Kennerspiel des Jahres nominee Raiders of the North Sea. Ice Cool, winner of the this years Kinderspiel des Jahres, also won the Deutsche Kinderspielepreis. In Terraforming Mars, players take the role of giant corporations, sponsored by the World Government on Earth, to initiate huge projects to raise the temperature, the oxygen level, and the ocean coverage until the environment on Mars is habitable. Players then buy project cards into their hand and later, when they have the resources needed, they can play the cards and ultimately place tiles on Mars itself. There are three different types of cards: Red cards provide actions that have an instant effect and are then discarded until the end of the game; Green cards have a one-off effect but their “tags” are retained, and Blue cards have an ongoing effect and/or an action that can be activated once per round. It is building these card combinations that is at the core of what we have found to be an interesting game. This entry was posted in News and tagged Great Western Trail, Ice Cool, Kingdomino, Raiders of the North Sea, Terraforming Mars on November 7, 2017 by nannyGOAT. The rules state that each player starts with eight cards and a face down deck of twelve cards. After six turns, each player has two cards remaining and restores their hand to eight by taking six from the deck, which happens a total of three times. The game plays a maximum of four, so there are a number of cards left unused. We started with three players, Pink, Blue, Burgundy, but then Green & Violet turned up, so we fiddled the rules to make the game play five, by reducing the number of cards each player had in their deck, such that each player would draw six, five and four cards, rather than six each time. This worked quite well, though Pink felt that it made the game much more difficult to play. The game was quite tight in the early stages, with different players trying different strategies, but in the final accounting it turned out that Pink had more pairs than anyone else as well as both ten point bonuses giving him a sizeable winning margin of twelve, pushing Green into second place. With the food and the “gaming starter” over, it was time for the main course, our “Feature Game”, Terraforming Mars. Almost everyone was really keen to play, so, since we had two copies available, we decided to split into two groups and play two parallel games. This began a big debate about who would play in each group. It made sense for Green and Violet to play in the same group, but Blue wanted to play with Pink as she doesn’t see much of him. There were also gaming considerations as we wanted to make sure there were people who knew what they were doing on both tables but nobody wanted to move about too much. In the end Black swapped seats with Violet and we were ready to start, though since we were nearly all new to it, we had to go through the rules first. The idea is that players take the role of giant corporations, sponsored by the World Government on Earth, to initiate huge projects to raise the temperature, the oxygen level, and the ocean coverage until the environment on Mars is habitable. Players then buy project cards into their hand and later, when they have the resources needed, they can play the cards and ultimately place tiles on Mars itself. There are three different types of cards: Red cards provide actions that have an instant effect and are then discarded until the end of the game; Green cards have a one-off effect but their “tags” are retained, and Blue cards have an ongoing effect and/or an action that can be activated once per round. It is building these card combinations that is the interesting part of the game, but also the part that some players struggle most with. Each round (or Generation as they are called in the rules) begins with drawing four cards. In order to keep these cards, players must pay three M€, the currency used in the game. Next, players take it in turns to carry out one or two actions and continue to do so until every player has passed. At the end of the round everyone gets resources according to their Terraform Rating and production ability. Everyone starts with the same Terraform Rating which increase when players raise one of the three global parameters (temperature, oxygen level, and ocean coverage) – this forms the basis of players’ end game scores as well as their income at the end of each Generation. Each player also has their own production track for the six key resources, M€, Steel, Titanium, Plants, Energy, and Heat. Each resource has a primary use in addition to any uses that project cards may make of them. For example, M€ are generally used to buy cards into players’ hands and then to pay to activate them. On the other hand, Steel and Titanium can be used to activate specific types of cards in place of M€; although they can be much more efficient than the currency, their use is much more restricted. Plants can be used to provide greenery on the surface of Mars which in turn gives oxygen. Energy can be used by in conjunction with projects and all residual energy is turned into heat at the end of the round which in turn can be used to warm the planet. The guts of the game are the actions. Players take it in turns to carry out one or two actions and continue carrying out actions until every one has passed. In this way, players can ultimately have take as many actions as they like, though they will be limited by the resources they have. The actions are: play a card, paying any costs and carrying out any associated actions if appropriate; use the action on a Blue card played previously, or carry out a standard action. The standard actions mostly involve paying for things at a very high rate. Typically it is much more efficient to do these actions by playing cards, however, sometimes it is worth paying the inflated price because of the way the actions combine. In the introductory game, every player starts with the same amount of money and project cards, however, despite the lack of experience, both groups decided to play with the Corporation cards. These have delightfully imaginative names like, “Interplanetary Cinematics” (Green), “Inventrix” (Violet) and “Republika Tharsis” (Burgundy). These potentially give players a bit of a steer as to what project cards to buy and later, hopefully, play. With almost everyone new to the game (though several had struggled to read through the rules), it was a steep learning curve that started straight away when we had to choose which cards to pay to keep from our starting hand of ten. This is one of the big challenges of the game as keeping cards costs money and money is scarce. Ivory (who had played before, albeit solo) got his table going first, but fairly quickly, they discovered it was generally better to do one action at a time, unless a second relied on a first and there was a chance it might not be possible to play it if someone else got there first. This was slightly counter to the other table where players started out trying to take both actions, though they also quickly decided that since the last player can keep going at the end, sometimes it is better not to force that second action. One standard action is to claim a Milestone. Claiming these costs M€, but can be a good way to add points. Players can also pay to activate Awards which will give points to the most effective players in certain fields. On Ivory’s table, the Milestone and Award points were fairly evenly spread and it was the Terraform Rating that had the largest influence on the placings, with Ivory finishing three points ahead of Green. On the other table, the opposite was true with players’ Terraform Ratings very even and Milestones as the key battle-ground. Burgundy just pipped Blue to almost all of them so she countered funding a couple of awards and winning them. It was the cards that made the difference though, and Blue picked up a massive fourteen points leaving her seven points clear. The battle for second was more interesting though, with Burgundy and Pink finishing level. On reflection both players felt they had missed scoring points on the table with Pink certain he had forgotten to add to his Puppy Farm on at least one occasion. We let the points stand though and Money-Bags-Burgundy took second on the tie-break. We all felt that the game has high potential for “Analysis Paralysis”, particularly at the beginning, in deciding which cards to keep (a problem made worse for on the first play which is why the Beginner Corporations give players ten cards drawn at random). The game could be won or lost on decisions about which cards to keep. Miscalculations like paying for that extra card that then didn’t leave enough money to play that one really important card that had been saved for can also prove critical. There were some nasty actions, too. For example, Green got caught out in his penultimate turn when two of his plant cubes were snatched which left him short of plants to terraform a tile. Thus he was unable to gain the additional Steel he needed to pay for the next card he was planning which would have given him more plants for another end of game terraforming tile, as well as extra points. Since this happened to Green just before his turn, he then spent far too long trying to work out whether he could still do it a different way and if not, then what should he do instead! The game is full of such enjoyable but difficult decisions, which perhaps explains why it has been the subject of a lot of chatter online, culminating in its recent nomination for this year’s Kennerspiel des Jahres. It also explains why everyone was concentrating so hard that nobody could really remember what they had been trying to do, what had worked and why. All that said, the game is a long way from being perfect and bears a lot of the hallmarks of a crowdfunded game, with very difficult rules and variable production values (some over-produced pieces while others could be improved). In actual fact, the game was originally produced by the Swedish company, FryxGames, a small family run company primarily consisting of four brothers with the rest of their substantial family helping in designing and testing, illustrating and translating. Although the rules are very difficult to get to grips with and arguably could be better written, the folks at FryxGames have made some exceptional online teaching material available. One of the other not insignificant issues is the number of small cubes on the individual player boards. These mean that it is pretty much guaranteed that at some point the table will take a bump and everyone will have to try to remember where everything was. Unfortunately, these issues and the difficulty producing the game in sufficient quantities to supply the demand it would lead to, probably mean Terraforming Mars won’t actually win the Kennerspiel des Jahres. We mostly really enjoyed it though, and almost everyone was keen to give it another go. In fact only Purple wasn’t keen on playing it at the start with and playing it probably didn’t really change her mind, as it’s just not really her sort of thing. Learning Outcome: Difficult decisions almost inevitably lead to Analysis Paralysis, but sometimes it is worth it. This entry was posted in Games Night and tagged 3 Sind Eine Zu Viel!, 6 Nimmt!, Terraforming Mars on June 13, 2017 by nannyGOAT. We’ve discussed the possible nominations a couple of times within the group, but nobody really had much idea this year. Part of this is because we’ve not really engaged with many of these, though Kingdomino did come up and we are planning to play Terraforming Mars on 30th May, so we will be able to make our minds up about that one then. Fabled Fruit, Captain Sonar, Great Western Trail and The Grizzled also came up in our discussions and these were recommended by the Jury. 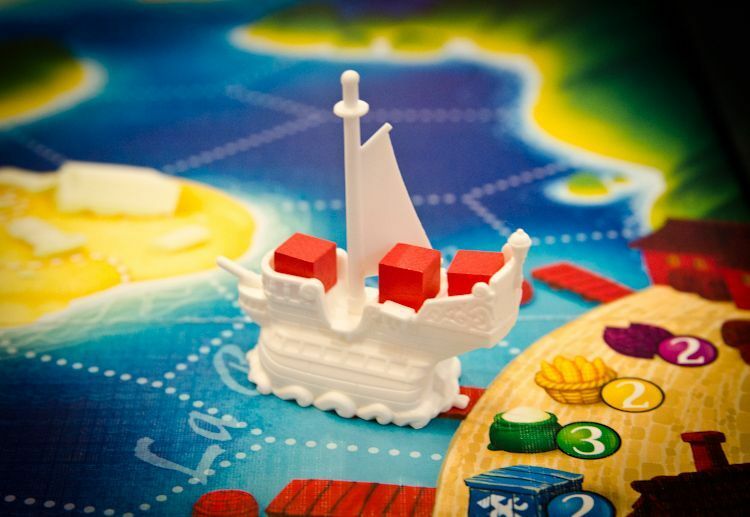 The winner of the Kinderspiel des Jahres will be announced in Hamburg on 19th June, with the Spiel and Kennerspiel des Jahres a month later in Berlin on 17th July. This entry was posted in News and tagged Captain Silver, Captain Sonar, Der Mysteriöse Wald, EXIT: Das Spiel, Fabled Fruit, Great Western Trail, Ice Cool, Kingdomino, Magic Maze, Raiders of the North Sea, Terraforming Mars, The Grizzled, Wettlauf nach El Dorado on May 22, 2017 by nannyGOAT. We started the evening setting up the card games, The Golden Sails and 3 Sind Eine Zu Viel!, but as more players arrived and time was getting on, we abandoned them in favour of the “Feature Game”, Bokken Schieten (aka Ziegen Kriegen or Cliff Hanger). This is a game that that arguably should be come the group’s signature game as it is very simple little trick taking card game all about goats. As the rules were explained, Grey (on one of his rare, but much valued appearances), commented that it was like Blackjack (aka Pontoon or Vingt-et-Un) – i.e. play to a limit, but exceed that limit and you are bust. The idea is that players choose a card from their hand and play it face up in front of them – the person who plays the highest card takes the trick and with it all the cards played in the round. The player who plays the lowest card plays draws a Goat Island card. These have two ends with different numbers on them, so the first “loser” takes a card and places the goat-meeple on one end, choosing which end will become part of Goat Island. The game continues with players playing cards and winning tricks, and the player who plays the lowest numbered card adding to Goat Island, choosing whether to add a large or small amount to the total. At the end of the game, the total of the four cards that make up the island define the limit and players who exceed that value are out. The catch is that players are not summing the face value of the cards (which go from one to fifty), instead, a little like 6 Nimmt!, they are counting goats head symbols which have little relation to the face value of the cards. We played the game twice through, since we made a bit of a mess of it the first time. After a long discussion about whether completed tricks should be placed face down or not, Red who led first misunderstood and thought the cards were played face down, so that screwed up her first turn and lumbered her with a pile of cards she didn’t want. This led to Grey’s comment that the game was poorly designed as once a player is bust their game is over. In fact though, the game is so short that effective player elimination doesn’t matter that much and in any case, players who are out can still try to take as many others with them as possible. After the first hand (taken by Grey), we gave it another try. By this time, Blue had managed to find out who leads after the first trick so instead of passing the honour round the table, we played correctly and the winner led. The second game went to Red, and was definitely more fun as we began to see what the aim of the game was and how to screw up other people. We were just beginning to get the hang of it, but felt we should move on to something else now everyone had arrived. It was genuinely very quick though, so we’ll probably play it again and it might be worth trying some of the variants too. With such a short “Feature Game” and everyone being far too polite, we spent a lot of time deciding what to play next. Orleans, Terraforming Mars, Viticulture and Agricola were all on the table, but nobody wanted to commit in case something better came along, or perhaps because they genuinely didn’t really mind and were happy to fill in once those who did mind had made a choice. Eventually, Magenta said she would like to play Isle of Skye and several said they’d be happy to play that if others wanted to play something else. Ivory on the other hand said he was quite happy to play Agricola (which had been brought with him in mind, then Green walked in, making things slightly more complicated as with nine players one game would have to be a five-player which might make it long. In the end Red got fed up with people being indecisive and started to direct people: first she made a three player game of Agricola, then she found two to join Magenta playing Isle of Skye which left Blue, Burgundy and Red to find something else to play, which ended up being Imhotep. Imhotep is a very simple game that we’ve played a few times since is was nominated for the Spiel des Jahres last year. 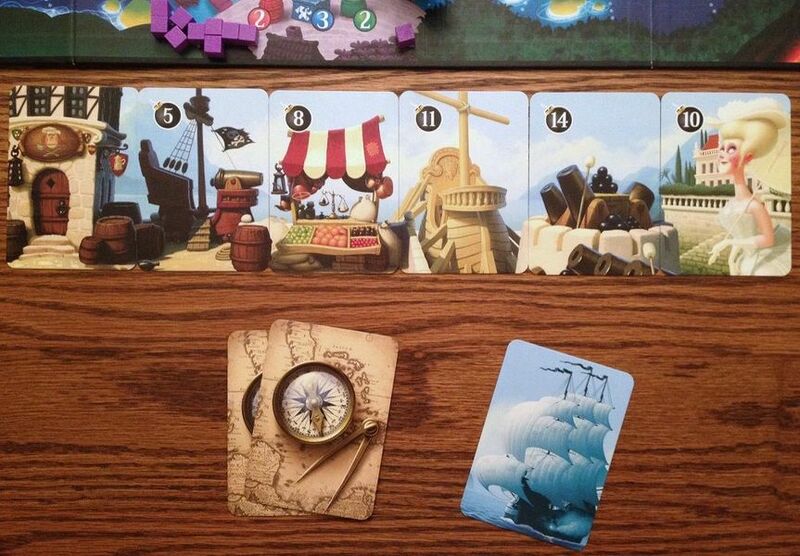 On their turn, the active player chooses one of four actions: procure new stones; load stones on a boat; sail a boat to a monument; or play an action card. Players can only store a maximum of five stones and when they procure stones they can collect a maximum of three. Stones are loaded onto ships one at a time, but which of the five possible destinations the boats end up at and the order they are unloaded in is vital, so timing and planning is everything. What makes it particularly tricky is that the best plans in the world can be crushed by opponents with one small action: when they take a boat to the “wrong place” or “at the wrong time”. There are four ships and five building locations, so one doesn’t get visited and the round ends when all four boats have sailed. The building locations are double sided so the game can be played with the less complex Side A, the slightly more confusing Side B, or a mixture of the two. Red had struggled last time she had tried Imhotep since she ended up playing with two people who had tried it before and wanted to play with Side B without fully appreciating how much more complexity it adds. This time, therefore, we stuck to the simpler Side A, but instead added the Stonemason’s Wager Mini Expansion to give it just a little extra interest. This little promotional item allows players a one-off, extra option: the chance to bet on which monument will have the most stones in it at the end of the game. Otherwise the game is unchanged and there are six rounds in total, as usual, with points scored in different ways for the different buildings; the player with the most points at the end is declared the best builder in Egypt. This time, Blue and Burgundy started out visiting the Market picking up statues, but with both in the same market it was always going to be a struggle. Meanwhile, Red stole an essentially insurmountable lead in the Obelisks. Blue took a green card that would yield a point for every three stones in the Burial Chamber at the end of the game, so she tried to encourage boats to go there. Unfortunately, because she also nearly picked up a significant score on the Burial Chamber, but Burgundy was first forced to obstruct her plans and then Red and Burgundy started sending boats to the Temple instead. In general, it was quite a cagey game with everyone concentrating on not letting anyone take too many points rather than trying to make a killing themselves. Going into the final scoring, it was all quite close. Red took the points for the Stonemason’s Wager, and Burgundy took points for statues, but Blue had a lot of bonus points from a range of sources, giving her first place, ten points ahead of Burgundy in second. Imhotep finished, but next game was not far behind, so Blue, Red and Burgundy played a couple of quick hands of Love Letter while they waited. With its quick play, this micro-game is one of our go to fillers. The idea is that each player has a single card in hand, and on their turn they draw a second and choose one of the two to play. Each card has an action and a number, one to eight. Players use the actions to try to deduce information about which cards others are holding and, in turn use that to eliminate them. The winner is either the last player standing or the player with the highest ranking card at the end of the game. In the first round, Blue was caught holding the Princess leaving Burgundy to take the round. The second played out to the final card. With just two possible cards left and the Princess still hiding, Red took a chance and played the Prince, forcing Blue to discard her hand. This meant she had to pick up the set-aside card, which was, of course, the Princess, making it a two-way tie. On the next table, Magenta, Purple and Grey had been playing a game of Isle of Skye: From Chieftain to King. This won the Kennerspiel des Jahres last year, and has proven to be quite popular with our group. The game is a sort of upgraded tile laying game with a lot in common with Carcassonne, but with the added feature of an auction at the start of each round and scoring at the end of each round. The scoring is one of the interesting parts of this game as the four scoring criteria change from game to game and, and each one scores three times during the course of the game. Choosing how to prioritise these to drive a strategy is one of the keys to playing well. This time, with points available throughout for completed areas (lakes and mountains), this was a clear target, however, identifying a strategy and making it work are two different things. For example, Purple was unlucky that she was unable to get any tiles with cows on roads until the final round, which meant she struggled to build a score early in the game. Although this meant she picked up the bonus money for being at the back, she still struggled to get the tiles she wanted. Similarly, Grey was unlucky in that he placed a tile that later became an real obstacle making it difficult for him to place tiles later and get points. It was Magenta though who had been able to build an early lead, and kept it throughout picking up points every round. A couple of lucky tile draws gave her good tiles that both Grey and Purple wanted making it a sellers market, and leaving Magenta with lots of cash to spend towards the end of the game. Going into the final scoring, Magenta had a sizeable lead, but Grey had a large pile of cash which yielded a tidy eight points and very nearly gave him the game. Magenta managed to fend him off though with the one point she took for her remaining seven coins, making the difference between first place and second. Meanwhile, all evening, Ivory, Black and Green had been engaged in an game of Agricola. This had started out with an extensive effort to disentangle the cards for the base game from the myriad of expansions Blue had somehow crammed into the box. Once this was sorted though, and the game was set up, a rules explanation was necessary as Ivory hadn’t played it before. The archetypal worker placement game, players star out with a farming couple and a shack and during the game try to build up their farmstead, livestock and family, the winner being the player with the most successful farm. Actions available include things like upgrading the farmhouse, ploughing and sowing fields, enclosing areas, taking livestock, and, of course, procreating. One of the clever parts of the game is that each round, an additional action become available, but the order of these is not known in advance. The stress is provided by harvests that occur at intervals during the game and require players to have enough food to feed their family, or resort to begging (which yields negative points at the end of the game). This time, instead of playing the family game, we played the full version which includes occupation and improvement cards. The challenge with this game is to use the cards effectively, but not to get carried away and try to force the strategy to use cards to its detriment. Green started with occupations and used them to quickly fenced a large padock for sheep (building one gave him three extras). He then ploughed and got three fields up and running before going back to enclosing pasture for cattle. Despite only having two family members, he struggled to have enough food until he eventually managed to nab a cartload of clay and used it to build a an oven, which proved invaluable at keeping hunger at bay. Towards the end, he finally managed to develop his family and added a pig for a total of twenty-nine. Black played a quiet game, also didn’t grow his family and farm developed only slowly too. As he often does, Black instead concentrated on home-making and upgraded his house to clay and then stone in quick succession. Somehow he didn’t struggle at harvest time as much as Green, probably because he went into building ovens which provided his food. This was at the expense of his farm, which remained stubbornly small, right until the end. The unused spaces cost him though, as did his lack of pigs, and he finished with a fine house, but only one child and a score of twenty-three points. Ivory went for a different strategy, starting by going for lots of food, and support for getting food later. In particular he made good use of his Mushroom Picker. Building his food engine so early enabled him to grow his family early in the game giving him extra actions. These he used to quietly collect lots of resources, which enabled him to build a large field for sheep. He then enclosed second pasture and just swiped a field full for boar before Green got them. He only ploughed late (perhaps it was the snowy landscape that delayed him), but his early food strategy really paid off. All his extra cards were valuable too and added ten points to his score, giving him a total of forty-one points and victory by a sizeable margin, despite Green’s inadvertent cheating! Just as Agricola came to an end, Splendor finished too. So, after helping to shoe-horn the miriad of little pieces back into the boxes, Ivory and Green headed off leaving Black to join the others. The ever dwindling numbers were boosted with the arrival of Pine, who had been two-timing us with the WI – he said they had the lowest average age of any WI he’d ever come across, so maybe that was the appeal. The remaining five gamers felt there was time for one more game, as long as we could keep it to about forty-five minutes. We are not the quickest at playing, or choosing and time was beginning to get tight, so we opted for Bohnanza as it played quicker than other suggestions and it wouldn’t need any rules reminders (like 11 Nimmt! and Port Royal). The game is one of our old staples, is quick to learn and keeps everyone involved throughout. The key to the game is that players cannot rearrange the cards in their hand and must play them in the order they arrive. Thus, on their turn, the active player first plays the first card in their hand with the option of playing the second if they desire. Once they’ve been planted, two cards are drawn which can be traded, but must be planted by someone. This can lead to free gifts, but also players being nasty and refusing to take even the apparently most lucrative trades. This time, Pine was making up for lost time, and the well-known good nature of the WI hadn’t rubbed off. He accused Burgundy of just about everything he could think of, in an effort to persuade everyone else not to trade with him. Black had one of his worst games for a long time with all the wrong cards coming up at the wrong time giving him nothing to work with. Otherwise it was a very tight game. In the dying turns, despite Black’s protestations, Purple and Pine both gave Blue exceptionally favourable trades (possibly in an effort to square things from earlier, but more likely to ensure that Burgundy didn’t win – again). Much to Pine’s surprise, that left him in joint first place with Blue, one coin ahead of Burgundy (possibly the most important factor to him). Feeling she had been gifted a joint win by Pine’s generosity at the end, Blue offered to concede to Pine, but on checking the rules he won anyhow on the tie-breaker, as the player with the most cards in hand at the end. Learning Outcome: Cheating doesn’t pay. This entry was posted in Games Night and tagged 11 Nimmt!, 3 Sind Eine Zu Viel!, 6 Nimmt!, Agricola, Blackjack, Bohnanza, Bokken Schieten, Imhotep, Imhotep: The Stonemason's Wager Mini Expansion, Isle of Skye: From Chieftain to King, Orléans, Port Royal, Splendor, Terraforming Mars, The Golden Sails, Viticulture on March 7, 2017 by nannyGOAT.